The newly announced partnership brings a tightly integrated video interviewing solution to ApplicantPro's powerful hiring software. 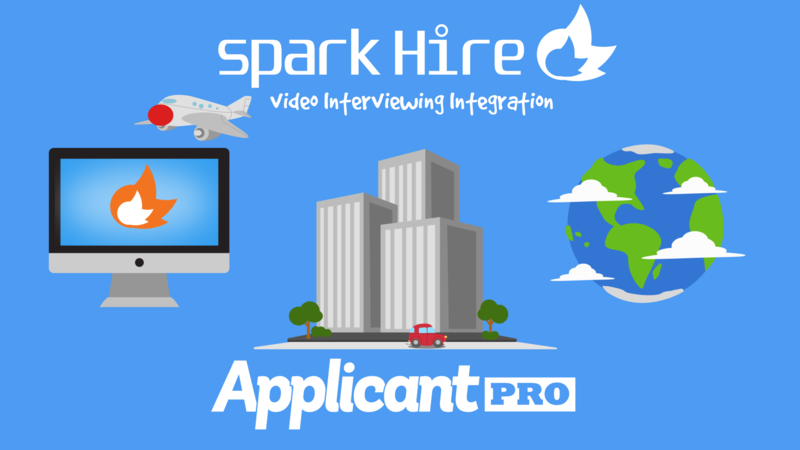 Chicago, Illinois, November 18, 2015	(Newswire.com) - Spark Hire (http://www.sparkhire.com), the leading video interviewing platform used by thousands of organizations worldwide, has announced its partnership with ApplicantPro (http://www.applicantpro.com), an all-in-one hiring software built to help small and medium sized businesses better manage their recruiting efforts. ApplicantPro offers a suite of services including job advertising, applicant tracking, assessments, background checks, and onboarding. With over 20,000 users from nearly 3,000 organizations, ApplicantPro makes it possible to achieve simplified, organized, and better hiring. "At ApplicantPro we are continually looking for partners that will bring products that can save hiring managers’ time, money, and help them find the best candidates available. Spark Hire video interviewing does just that,” says Ryan Kohler, Founder & Chief Innovation Officer of ApplicantPro. “With this integration our customers will be able to shorten their interview process, find better candidates, and reduce employee turnover, all within one system." With the integration, mutual customers can reap the benefits of Spark Hire’s video interviewing platform without bouncing between the two applications. Customers can schedule, review, and share video interviews directly from ApplicantPro. Together, Spark Hire and ApplicantPro are empowering hiring pros to hire the best candidates in the least amount of time possible. “We’re really excited to be partnered with ApplicantPro as both of our companies are extremely passionate about helping small and medium sized businesses hire the best employees for their respective companies,” says Tolan. To learn more about the integration, contact Spark Hire today. Spark Hire is the fastest growing video interviewing platform in the world. Offering a completely branded one-way and recorded live video interview platform, Spark Hire helps companies eliminate phone screens, gain more insight into candidates, and make amazing hires. No contracts, no setup fees. Unlimited video interviews. For more information, visit sparkhire.com. ApplicantPro’s hiring and applicant tracking system is built to make the hiring process easier. With over 2,700 happy customers, ApplicantPro integrates every piece of the hiring process into just one system. To learn more about ApplicantPro, visit applicantpro.com.